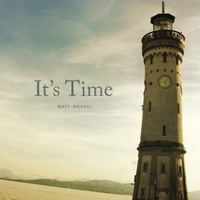 Born out of a year spent in Munich, Germany, "It's Time" is vintage Matt Wessel in its eclectic mix of styles and themes of real life, but with an updated, polished sound that only comes with time. A must hear. Words cannot describe how fantastic it was to be back in the ‘studio’ recording a new album -- an album that was very much overdue. After all, “Carry On” was released nearly seven years ago. Perhaps a more appropriate title for the album would have been “It’s About Time.” To those familiar with my other CDs, I think you’ll hear a noticeable difference in the style and lyrics throughout this collection, a change brought about by seven more years of living and experiencing life. I chose “It’s Time” as the title of the album for a few reasons. The song for which the album is named carries through it a message that I wish the whole world could hear. None of us are blessed with a burdenfree life. We all have faults, challenges and regrets. All of us eventually face difficult decisions and we all have crosses to bear. The message behind “It’s Time” is one of encouragement and support. It’s a message that begs the listener to see the need to take a step forward with the help of others – to start heeding the voices within their heart and to find the courage to live life to the fullest. As it relates to my music, I stand by what I wrote above that it was certainly past time for me to release a new album of original music. But beyond that, this album and the music it contains is, in my humble opinion, some of my best work. I think it demonstrates the latest in a song-writing evolution that began with “Pure Inspirations” and “Come Run With Me” nearly 15 years ago. And then there’s the year in which this album was recorded. My wife, Katie, and I spent all of 2012 in Munich, Germany. We moved there for her career and I spent the year doing a little bit of work, but an even greater bit of traveling, reading, researching and song-writing. It was a year the two of us will never forget. As the year went on, I became more and more aware of the fact that we were meant to be there. It was time for us to leave our Midwest life for a one-year adventure abroad. We were meant to experience all that we did in 2012 and our lives are forever changed because of it. To those who attend my concerts, some of the songs on this album are not new. The oldest, “This Could Be,” goes all the way back to 2006. But several have never been heard and most of them were written within the past year. And more than one were born out of a spontaneous, late-night session at my Munich keyboard. I hope you enjoy listening to these songs as much as I enjoyed writing and recording them. Thank you, as always, for supporting my music.